We’re trying to thoroughly explore Toronto’s neighbourhoods, one neighbourhood at a time. It may take us awhile, but that won’t stop us. Every single day as we walk around our city, we experience that each area offers something different to each person. Our intention is to highlight what we think is great about our city, one neighbourhood at a time. Enter LESLIEVILLE – our next neighbourhood vlog in this “neighbourhood series”. A family friendly district settled somewhere in the middle of Riverside, Distillery District, Greektown, The Beach and the soon to be re-vamped PortLands. Both Jon and I are “west-enders” by default. (Torontonians know that many times there seems to be 2 factions. The west-enders and the east-enders.) It was time for us west-enders to highlight that Toronto isn’t just the west end. The east end offers so many amazing pockets and neighbourhoods that beg to be uncovered and discovered! We have simply fallen in love with Leslieville. 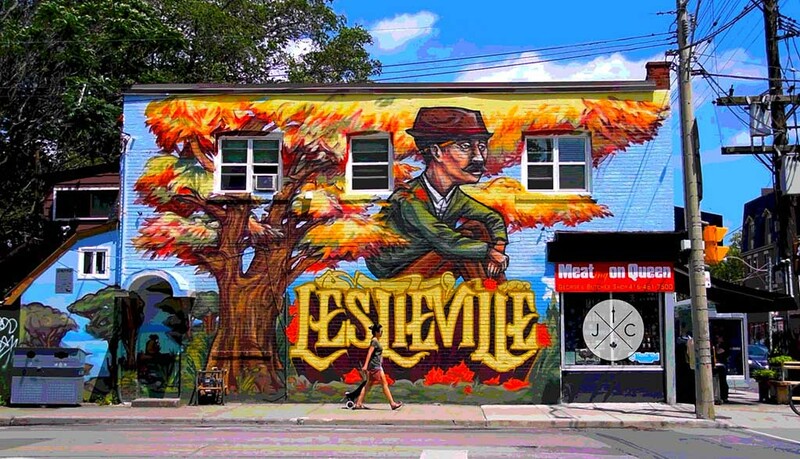 Leslieville was named after “George Leslie” and first came to life in the 1850’s. It was home to light industry for decades and since 2000 has been gentrified at a rapid rate. Gentrification brought those trendy cafes, shops, restaurants, bars, places & spaces. For example; Carlaw Avenue’s revamped industrial buildings that have been turned into loft and condominium spaces. As well, for those of you wondering, Leslieville does have a little crossover with the Riverdale neighbourhood (think the brand new Broadview Hotel). We could go on and on, but now is when you should stop reading and just watch the video. Culinary gems such as Gare De L’Est, Descendent Pizza, Barrio and Ed’s Real Scoop. See you in the next neighbourhood!